Are you a visual, literary or performing Artist based in Fairbanks, AK or its surrounding areas? Do you enjoy educating others about your craft? The Artists in Schools program, a collaborative effort among Fairbanks Arts Association (FAA), Fairbanks North Star Borough School District (FNSBSD) and Alaska state Council on the Arts, allows teaching artists the wonderful opportunity to work with students of the FNSBSD through artist residencies. Each residency is a unique and valuable learning experience for the students involved and serves as a professional development opportunity for FNSBSD teachers. 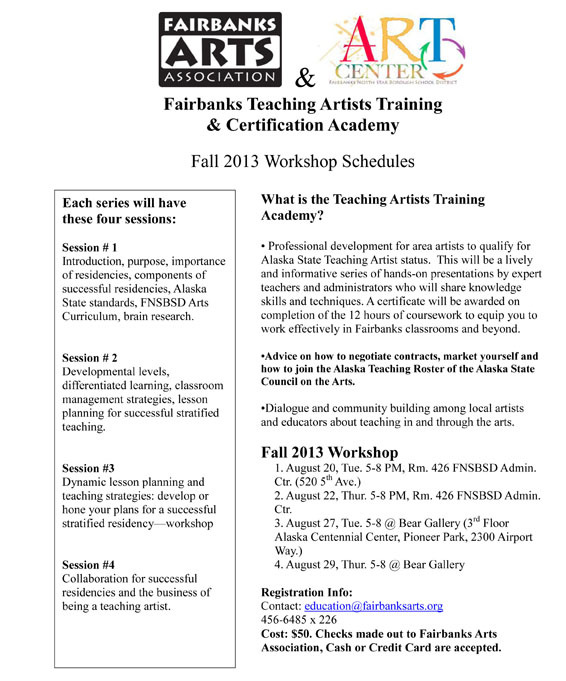 The Artists in Schools program has a long and successful history of bringing high-quality arts education to the students of the Fairbanks North Star Borough; if you are a teaching artist who would like to get involved, mark your calendars for the required training dates below and call soon to register for the sessions. For more information about the Artist in Schools program and to review the Fairbanks Arts & Cultural Education Handbook, please visit our Artists in Schools page.